Full range of screen printable pressure sensitive adhesives. Solvent and water based systems available. Suitable for printing onto cardboard, metal foils, laquered films and plastics. Free chart available, listing all products and specific applications. KIWOPRINT D 142 is a high quality, screen printable, pressure sensitive adhesive for the production of self-adhesive components for the automotive and electronic industry (touch panels, visual instrument panels, front panels, electrical devices). KIWOPRINT D 142 is permanently very sticky, very high heat resistant and cohesive. The dried adhesive film is colourless and does not turn yellow. KIWOPRINT D 153 HV is a high quality, pressure sensitive, screen printable adhesive for the production of self-adhesion materials e.g. for the automotive and electronic industry. It is very suitable for products that have to be very resistant to aging. KIWOPRINT D 153 HV has a high shear strength, good heat and water resistance. The dried adhesive film is colourless and very resistant to yellowing. KIWOPRINT D 158 is a high-quality pressure screen printable sensitive adhesive for the production of self-adhesive materials made of paper, cardboard, rigid PVC, rubber, technical foams, lacquered surfaces, etc. Very good adhesion to polyester and polycarbone films, polyethylene, polypropylene, glass and metal. KIWOPRINT D 158 has very good ageing and light resistance. Relatively soft texture makes it especially suitable for the application on difficult substrates, as e.g. polyethylene, polypropylene and polyamide. Materials bonded with KIWOPRINT D 158 can be used at temperatures of approx. -30°C to +100°C and can be stored for a minimum of 1 year without any decrease of adhesive strength, if covered with a suitable silicone paper and kept dry and dark at room temperature. KIWOPRINT D 159 AF is a high quality, pressure sensitive screen printable adhesive for the production of self-adhesive materials for the automotive and electronic industry (e.g. touch panels, visual instrument panels, front panels, electrical devices) when high peel strength is required. High viscosity allows printing of sucking surfaces (felt, PE foam). Materials bonded with KIWOPRINT D 159 AF can be stored for a minimum of 1 year without any decrease of adhesive strength, if covered with a suitable silicone paper and kept dry and dark at room temperature. KIWOPRINT D 177 is a high-quality, dispersion based pressure sensitive screen printable adhesive for the production of removable materials made of paper, cardboard, plastic films (e.g. displays, stickers and notepads etc.). Very good ageing and light resistance. Materials bonded with KIWOPRINT D 177 can be stored for a minimum of 1 year without any decrease of adhesive strength, if covered with a suitable silicone paper and kept dry and dark at room temperature. For KIWOPRINT D 177 we can provide a test certificate according to EN 71 Part 3 (safety of toys – migration of certain elements). KIWOPRINT D 178 screen printable adhesive is a dispersion based, pressure sensitive adhesive for the production of well adhering and removable materials made of cardboard and plastic films (e.g. displays, stickers etc.). Very good ageing and light resistance. Materials bonded with KIWOPRINT D 178 can be stored for a minimum of 1 year without any decrease of adhesive strength, if covered with a suitable silicone paper and kept dry and dark at room temperature. For KIWOPRINT D 178 we can provide a test certificate according to EN 71 Part 3 (safety of toys – migration of certain elements). PREGAN 1014 E solvent cleaner is a water emulsifiable solvent mixture for the removal of many printing inks, dried pigment printing pastes, pressure sensitive and flock adhesives, solder pastes and non-hardened solder resists. Dried solvent based printing inks can quickly be dissolved, dispersion based products swell and can be removed from the screen using a strong water jet. Despite its high efficiency, PREGAN 1014 E has very little attack on photoemulsions. KIWOPRINT TC 1500 screen printable adhesive is a high-quality pressure sensitive adhesive for the production of self-adhesive materials made of paper, cardboard, rigid PVC, glass, metal and technical foams as well as films made of polycarbonate, polyester and pre-treated polyethylene and polypropylene. Also suitable for inks transfers applied by the wet or dry transfer method. Materials bonded with KIWOPRINT TC 1500 can be used at temperatures of -20°C to +60°C and can be stored for a minimum of 1 year without any decrease of adhesive strength, if covered with a suitable silicone paper and kept dry and dark at room temperature. In general, the adhesive film is sufficiently light fast. Trials are absolutely essential if direct influence of sunlight is expected. Bondings achieved with KIWOPRINT TC 1500 are resistant to water, reduced aqueous acids and alkalis as well as to many mineral oils. A test certificate according to EN 71 Part 3 (safety of toys – migration of certain elements) can be provided. KIWOPRINT TC 1550 T screen printable adhesive is a high-quality, transparent pressure sensitive adhesive for the production of self-adhesive materials made of paper, cardboard, rigid PVC, glass, metal and industrial foams as well as films made of polycarbonate, polyester and pre-treated polyethylene and polypropylene. Especially suitable for ink transfers applied by the wet or dry transfer method. The adhesive film is colourless and transparent. Materials bonded with KIWOPRINT TC 1550 T can be used at temperatures of ca. -20°C to +60°C and can be stored for a minimum of 1 year without any decrease of adhesive strength, if covered with a suitable silicone paper and kept dry and dark at room temperature. In general, materials bonded with KIWOPRINT TC 1550 T are sufficiently light fast. If direct influence of sunlight is to be expected, trials are absolutely essential. Bondings are resistant to water, reduced aqueous acids and alkalis as well as to many mineral oils. KIWOPRINT TC 2000 screen printable adhesive is a high-quality pressure sensitive adhesive for the production of self-adhesive materials made of paper, cardboard, rigid PVC, glass, metal and industrial foams as well as films made of polycarbonate, polyester, pre-treated polyethylene and polypropylene. Suitable for decals made by the wet or dry transfer method. Materials bonded with KIWOPRINT TC 2000 are very difficult to remove or even irremovable, depending on the characteristics of the substrate. Materials bonded with KIWOPRINT TC 2000 can be used at temperatures of approx. -20°C and +60°C and can be stored for a minimum of 1 year without any decrease of adhesive strength, if covered with a suitable silicone paper and kept dry and dark at room temperature. In general, the adhesive film is sufficiently light fast. If direct influence of sunlight is to be expected, trials are absolutely essential. Bondings are resistant to water, reduced aqueous acids and alkalis as well as to many mineral oils. KIWOPRINT TC 2500 screen printable adhesive is a high-quality pressure sensitive adhesive for the production of self-adhesive materials made of cardboard, rigid PVC, glass, metal and industrial foams as well as film made of polycarbonate, polyester, polyethylene and pre-treated polypropylene. Materials bonded with KIWOPRINT TC 2500 are very difficult to remove or even irremovable, depending on the characteristics of the substrate. Materials coated with KIWOPRINT TC 2500 can be stored for a minimum of 1 year without any decrease of adhesive strength, if covered with a suitable silicone paper and kept dry and dark at room temperature. In general, the adhesive film is sufficiently light fast. If direct influence of sunlight is to be expected, trials are absolutely essential. Bondings are resistant to water, reduced aqueous acids and alkalis as well as to many mineral oils. KIWOPRINT UV 25 screen printable adhesive is a high quality, screen print applied, pressure sensitive adhesive for the production of articles of paper, cardboard and plastic foils which can be removed repeatedly. 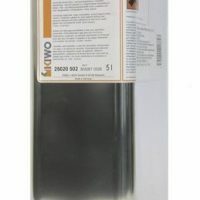 KIWOPRINT UV 25 has good ageing resistance. KIWOPRINT UV 33 screen printable adhesive is a high quality, screen print applied, pressure sensitive adhesive for the production of self-adhesive components made of rigid PVC, glass metal and film made of polycarbonate, polyester and pre-treated polyethylene and polypropylene. Depending on the properties of the substrate, adhered Products can be removed only hardly or not all from the substrate. KIWOPRINT UV 33 is preferably used for adhesions exposed to light, e.g. display behind glass, transparent film, etc. The printed and cross-linked adhesive layer is colourless and resistant to water. KIWOPRINT UV 60 screen printable adhesive is a high quality, screen print applied, pressure sensitive adhesive for the production of self-adhesive components for the automotive and electronic industry (touch panels, visual instrument panels, front panels, electrical devices) where high peel strength is required. Storing the products printed with KIWOPRINT UV 60 appropriately (i.e. covered with suitable silicone paper, kept dry, in absolute darkness, at room temperature), they can be kept in stock at least 6 months without loss of the adhesive power. These products can be used at temperatures of approx. -30°C to +85°C. After cross-linking, KIWOPRINT UV 60 is light yellowish, partly resistant to light and has a very good water resistance. KIWOPRINT UV 92 screen printable adhesive is a high quality, pressure sensitive adhesive for the production of self-adhesive components made of rigid PVC, glass metal and film made of polycarbonate, polyester and pre-treated polyethylene and polypropylene. It is applied by screen printing. For special applications, KIWOPRINT D 162 can also be used for the production of dry and wet transfers. Materials bonded with KIWOPRINT D 162 can be stored for a minimum of 1 year without any decrease of adhesive strength, if covered with a suitable silicone paper and kept dry and dark at room temperature. KIWOPRINT TATTOO L 1050 screen printable adhesive is a high-quality pressure sensitive adhesive for the production of wet and dry transfers. A special field of application is the production of so-called "tattoos"; tattoo-like transfers onto skin. KIWOPRINT TATTOO L 1050 is made of raw materials which are suitable for direct contact with skin and indirect contact with edibles. The certificate with the classification “not irritant” according to ETAD SUBCOMITTEE FOR TOXICOLOGIE can be obtained upon request. Materials bonded withKIWOPRINT TATTOO L 1050 can be stored for a minimum of 1 year without any decrease of adhesive strength, if covered with a suitable silicone paper and kept dry and dark at room temperature. In general,the adhesive films are sufficiently light fast. Trials are absolutely essential if direct influence of sunlight is expected. Bondings achieved with KIWOPRINT TATTOO L 1050 are water resistant. KIWOTHERM L 110 screen printable adhesive is used to bond a wide variety of materials (particularly plastics). Bonds made with KIWOTHERM L 110 have very good resistance to water, alcohol and mineral spirits. Both interior/ exterior applications are possible; test all new materials/ applications before production. Water based, CFC (chlorofluorocarbons) free, non-flammable spray adhesive. AQUA TEC NF 2 is a non-combustible, sprayable adhesive that does not contain CFCs as propellants. The main field of application is fabric fixation on printing tables, during the printing process, particularly when using flash-curing units for drying. In addition, it is suitable for adhering various materials such as paper, cardboard, textiles, glass and many plastics. Ideal for textile screen printing. KIWOFIX SX is a sprayable adhesive which can be used as a contact, mounting or pressure sensitive adhesive. KIWOFIX SX is used for the secure bonding of paper, cardboard, felt, wood, metals, crêpe rubber, styropor and many plastics. KIWOFIX SX produces a beige, slightly opaque adhesive film. 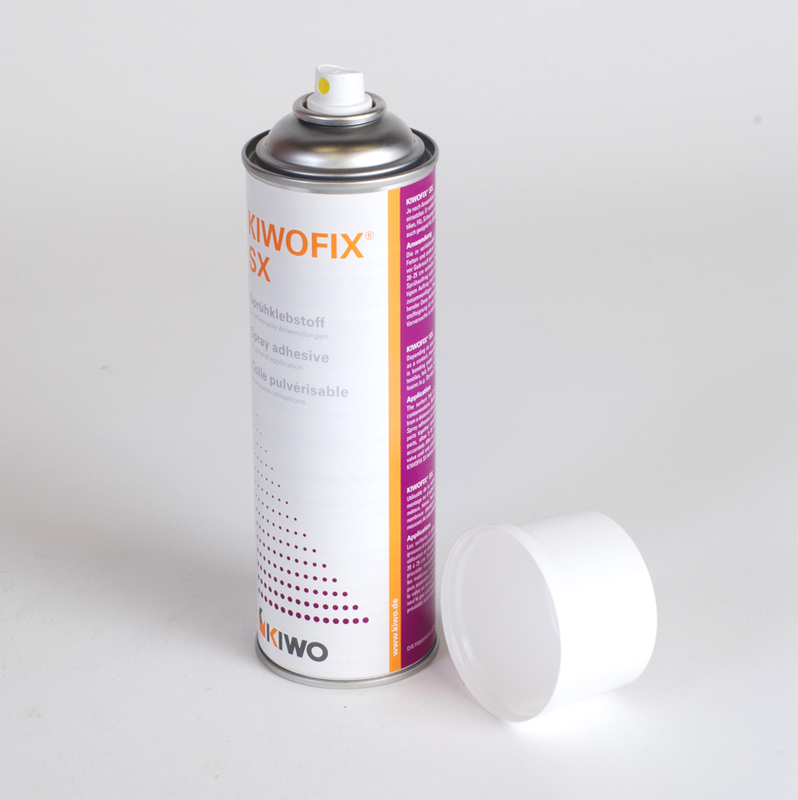 The fine adhesive drops spread evenly and thinly, so that KIWOFIX SX can be applied economically. 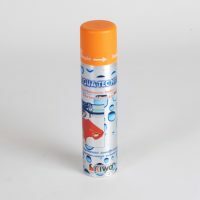 The fog-like spray jet also penetrates into fine openings which are not filled by liquid or pasty adhesives. After 24 hrs. final adhesion is achieved. MECOSOL THERMOPLUS is a spray contact adhesive with propellent free from CFC. The main application of MECOSOL THERMOPLUS is fixing textile fabrics onto printing tables during the printing process. MECOSOL THERMOPLUS is especially suitable for "flash-curing"-processes. Moreover, it may be used to apply self-adhesive finishing to paper, card board, textiles and many plastics. MECOTEC D 165 screen printable adhesive is a pressure-sensitive, dispersion-based adhesive with low viscosity. A transparent adhesive film is produced with high cohesion and excellent adhesion to paper, cardboard, hard PVC, rubber, painted surfaces, polyester and polycarbonate film. MECOTEC D 165 has very good aging and light-fastness properties. KIWOPRINT ANTISLIP HT is a high quality, screen printable paste for the production of anti-slip coatings on plastic film. After cross-linking the polymer film is colourless, has good aging and very good water resistance. 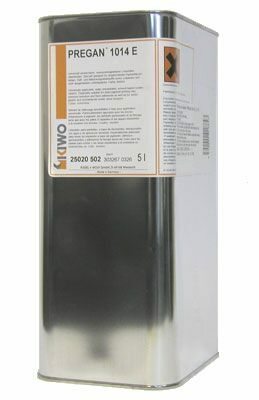 KIWOPRINT PRO-TECT D 50 B is a protective lacquer based on aqueous polymers. 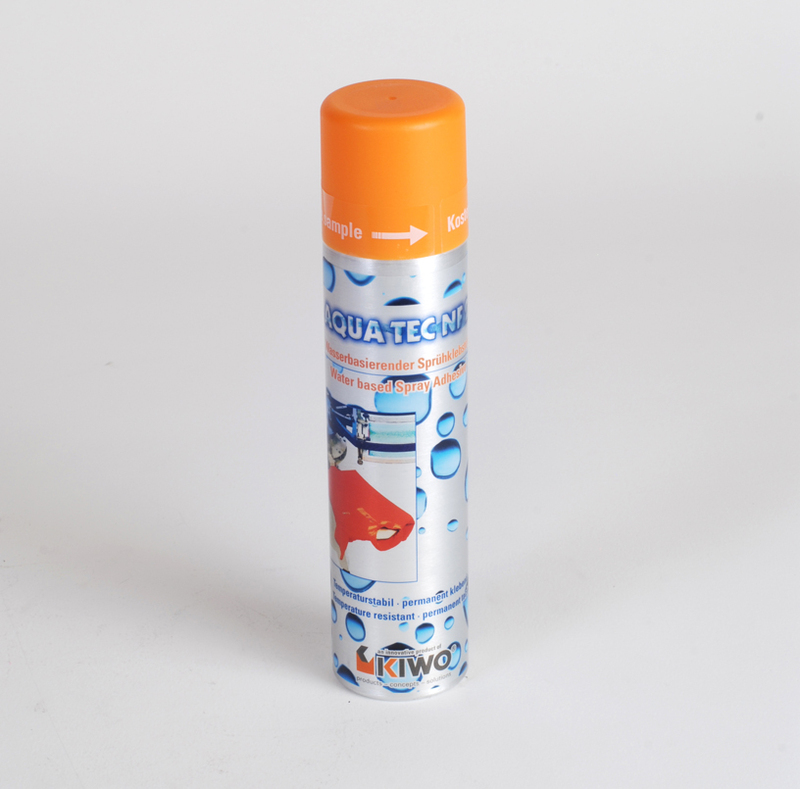 It is applied by screen printing and protects component parts against mechanical damage. It has good flow and wetting properties. Make trials to test adhesion and removal of the dried film from different substrates. Do not store protected component parts in very humid climate. KIWOPRINT SBR 110 is a removable, screen printable media, resistant to sand blasting for the decoration and protection of glass and many other substrates. After drying, KIWOPRINT SBR 110 is resistant to all usual sand blasting processes and can be removed.